Choosing to take the road less travelled, silversmith Sebastian Halyard and his travelling companions, Meadow and Onyx, follow the geese and the seasons in a quest to avoid the status quo and live simply and for the moment. Sebastian Halyard is not your typical RVer. He doesn’t consider himself a traveller by nature, even though he has been living a nomadic lifestyle full time since 2006. He’s not driven by a desire to see sights that draw tourists to an area. 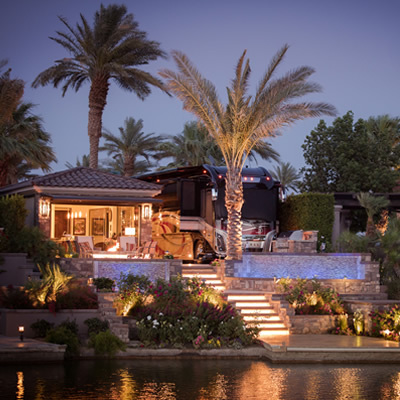 And when he made the choice to live life on the road, he sold his more luxurious fifth wheel and bought a much more compact 2001 Casita—what he called one of the best investments he’s ever made. 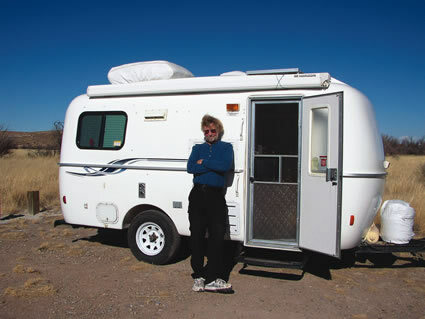 He now tows it with a 1991 Jeep Cherokee across many of the southwestern states. But he’s quick to point out that it’s not his primary mode of transportation. Like the geese, Halyard has a rhythm to his year. He makes a regular loop through Arizona, Utah, Colorado and New Mexico, taking different routes and catching up with old friends. Halyard said he prefers to set up camp off the grid on public lands—although this past winter’s cooler temperatures were enough to convince him of the benefits of electrical hookups and reliable heat. When he finds his spot, Halyard establishes a base for himself for a week or 10 days and sets to thoroughly exploring the area. He claims to have put more miles on his hiking boots, running shoes and mountain bike than on his Jeep Cherokee. Indeed, the simple life is one of the strongest appeals for Halyard. He finds the greatest pleasure in day-to-day activities that many of us tend to take for granted, because he lives in the moment. He enjoys travelling the back roads, where he often meets people cut from the same bolt of cloth: sightseers looking for the quieter beauty far from the highway. Of course, Halyard isn’t a complete recluse. He has two constant travelling companions: Meadow and Onyx—two cats that he adopted from animal shelters. They have turned out to be well suited to the nomadic life. Halyard said they sleep in the Jeep until the ride starts to get a bit rough—usually because Halyard has turned down a seldom-used dirt road—and then they wake up and start watching out the windows. The furry tourists thoroughly inspect their new digs but never stray far from camp. Halyard grew up in New Jersey before moving to Utah in 1981. He was a teacher for 20 years, teaching shop and computers at the elementary and middle school levels. He also taught silversmithing classes in the local school district community education programs and in the lifelong learning program at the University of Utah. It is in silversmithing that Halyard found his true passion. Halyard’s silver pieces are an extension of his artistic and spiritual nature—simple and beautiful. He started using the metal in the early ’70s when he was working toward an industrial education degree, and found himself taken with the colour and light-reflecting qualities of silver. Each piece is unique, using simple designs and techniques. He sells his work in galleries and on the road. Besides providing him the ability to be continually creative, Halyard’s art gives him an income that allows him to keep exploring the trails. As well, he never passes up an opportunity to instruct a class in silversmithing; in 2008, he taught a class at the Kimball Art Center in Park City, Utah. He estimates he only needs to work four months of the year to sustain his lifestyle. It’s not bad work if you can get it. In the near future, Halyard plans to explore the backcountry of places he hasn’t yet visited: the countless hiking trails throughout Idaho, the mountain terrain in British Columbia and the larger-than-life Yukon. There is no set time schedule for these ventures, however; it depends on when the geese go.